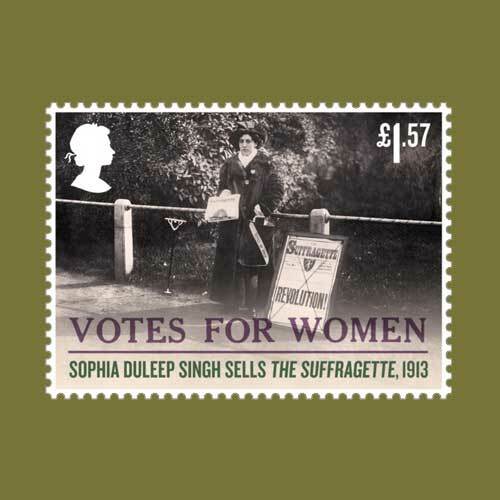 The Royal Mail recently released a new postage stamp honouring Princess Sophia Duleep Singh. She was born to the last king of Punjab, Maharajah Duleep Singh, at the Elveden Estate near Thetford and lived a luxurious life during her early years. Later on, she then went on to become a member of the Women’s Social and Political Union and started fighting for Women’s rights. She was daring enough to sell copies of The Suffragette outside Hampton Court Palace. A Black Friday demonstration to the parliament by 400-people was led by her with Mrs Pankhurst in November 1910. The protesters also bravely resisted attacks and physical assaults by the police force. She stopped paying taxes to appear in court with an intention to share her views even though she hated public speaking. A set of Royal Mail stamps was released to honour various suffragettes and events from the movement. They also feature working class women and women of colour. Finally the Representation of the People Act was passed on 6th February 1918. After this, women over the age of 30 and men over the age of 21 were allowed to vote. After 10 years, men and women were given equal rights for voting.